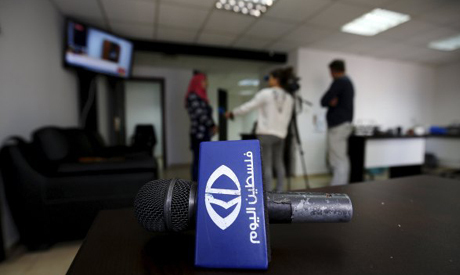 Israeli occupation forces on Friday raided the Ramallah offices of a Palestinian television station accused of inciting violence, the security services said, after the government approved new measures to combat unrest. The Shin Bet security agency said in a statement that the station, Palestine Today, backed the Islamic Jihad group and had been helping to fuel a five-month wave of violence. "The channel served the Islamic Jihad as a central means to incite the West Bank population, calling for terror attacks against Israel and its citizens. Incitement was broadcast on the television station as well as the Internet," it said. The recent surge in violence has raised concern of wider escalation, a decade after the last Palestinian uprising subsided. Since the start of October, Israeli occupation forces have killed at least 190 Palestinians. Meanwhile, almost daily stabbings, shootings and car-ramming attacks by frustrated and unarmed Palestinians have killed two Americans, an Eritrean and a Sudanese, according to an AFP count. The current wave of protests by Palestinians and repression by Israeli occupation forces started in late July when toddler Ali Dawabsha was burned to death and three other Palestinians were severely injured after their house in the occupied West Bank was set on fire by Israeli settlers. Settlement-building, racial discrimination, confiscation of identity cards, long queues at checkpoints, as well as daily clashes and the desecration of Al-Aqsa mosque, describe Palestinians' daily suffering. On Friday night a gunman shot and wounded two Israeli soldiers at a checkpoint near the village of Beitunia, west of Ramallah, the army said. Police said neither was badly injured. "Forces are conducting extensive searches in the area for the gunman, who fled the scene," an army statement said. The incident followed clashes near the village in which Palestinians hurled rocks and at least one petrol bomb at armoured army patrol vehicles. Occupation troops fired tear gas and rubber bullets in response. Earlier in the day a Palestinian stabbed an ultra-Orthodox Jewish man in Jerusalem's Old City, leaving him moderately wounded. The assailant, 18 years old and from the West Bank, was arrested after a brief search of the area, police said. The surge in violence has been fuelled by Palestinians' frustration over Israel's 48-year occupation of land they seek for an independent state, and the expansion of settlements in those territories which were captured by Israel in the 1967 Middle East war. Palestinian leaders say a younger generation sees no hope for the future living under Israeli security restrictions and with a stifled economy. The latest round of U.S.-brokered peace talks collapsed in April 2014. In the Gaza Strip, Palestinian fighters fired rockets across the border into Israel late Friday night, the occupation army said. Early Saturday Israeli aircraft retaliated, striking Hamas bases in the Gaza Strip and killing a child living near one of the targets, Gaza health ministry spokesman Ashraf al-Qudra said. Yassin Abu Khussa, 10, died in a raid on a base of the group's military wing, the Ezzedine al-Qassem Brigades, at Beit Lahiya in the north of the strip, he said -- one of four strikes the Israeli military said it carried out in response to rocket fire into Israel. His sister Yasmin, 6, was seriously wounded and his brother Ayub, 13, suffered moderate injuries, al-Qudra told AFP. In Friday's raid on Palestine Today in Ramallah, occupation security forces arrested office manager Farooq Aliat, 34, which they called "an Islamic Jihad operative who had been imprisoned in Israel for his activities". Cameraman Mohammed Amr and technician Shabib Shabib were briefly detained then released, the Palestinian Journalists' Union said. An Israeli army order in Arabic declaring the premises closed indefinitely was posted on the door. TV production company Trans Media, in the same building, was also raided and equipment was taken away, AFP journalists at the scene said. Trans Media provides facilities for several foreign and local stations, including Palestine Today. The channel, which is based in the Hamas-controlled Gaza Strip, said it continued to broadcast to the Israeli-occupied West Bank via its Lebanese transmitters. Islamic Jihad denounced the "Israeli aggression against the nationalist media of the resistance," calling the raid "another episode in the long saga of oppression by the occupation". Senior Palestine Liberation Organisation official Hanan Ashrawi condemned the Israeli operation, saying it showed "the will of the extremist Israeli government to silence every Palestinian voice". Israel blames incitement by Palestinian leaders and media as a main cause of the current violence. Since October Palestinian Today has been showing a "Jerusalem Intifada" logo on screen during its reports on the violence. In November, Israel shut down two radio stations in the flashpoint West Bank city of Hebron -- Al-Hurria and Al-Khalil -- accusing them of fanning the violence. On Tuesday Israeli Prime Minister Benjamin Netanyahu decided on new measures, including a crackdown on Palestinian broadcasters and completion of the unfinished security barrier between Jerusalem and the West Bank. He also ordered the cancellation of Israeli work permits for relatives of Palestinian attackers and fast-track demolition of perpetrators' homes. Israel has increased its efforts against unauthorised Palestinian labourers, arresting more than 400 workers and dozens of their Israeli employers over the past two days, police said. *The story has been edited by Ahram Online.